Of course you have heard of Green Tea. Its the in-thing now. Varieties of green tea with different flavours are available to pick and choose from. Sometimes it leaves you confused. 'Problem of the Plenty'. Drink it up. It does you loads of good. 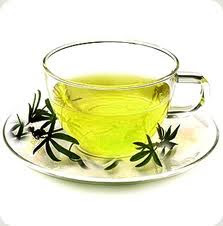 Green tea releases catechin, an antioxidant with proven anti-inflammatory and anticancer properties. Research found that drinking 2 to 6 cups a day not only helps prevent skin cancer but might also reverse the effects of sun damage by neutralizing the changes that appear in sunexposed skin. Other studies show that green tea—infused with another antioxidant called epigallocatechin gallate (EGCG)—can boost your cardiovascular health and reduce the risk of most types of cancer. Switch to Green Tea instead of Coffee or any other beverage. The Koreans add a little rice broth to counter the bitter taste of pure green tea. You can add a dash of lemon or orange juice. Your imagination is the limit.